Last night, I revisited The Most Delicious Meatballs in the World (and, yes, just as delicious the second time around!). 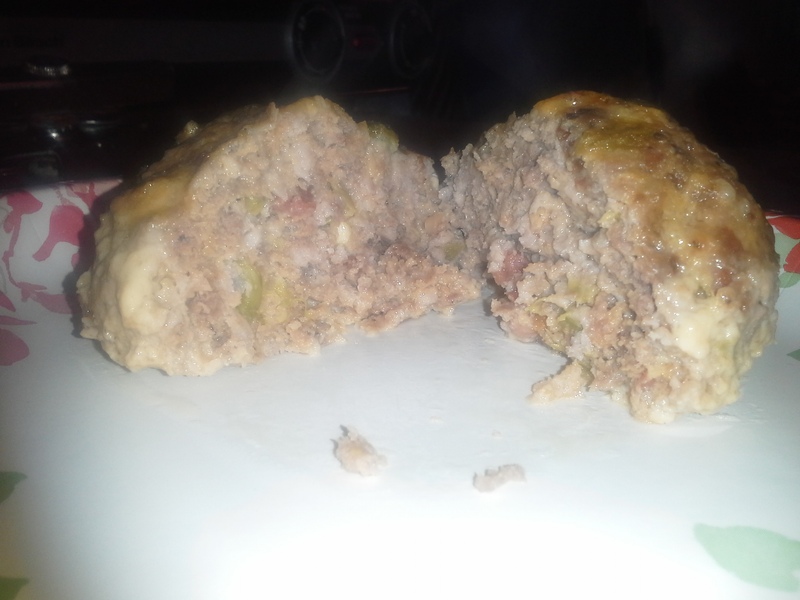 And after making the Bacon-Wrapped Green Chile Cheeseburger, I came up with the idea to try to combine the two. And at this point, I have to thank my mother for teaching me not to be afraid of trying new things in the kitchen and for making me taste foods before saying “yuck”—because it taught me what I like and don’t like and what flavors work well together. While this recipe isn’t yet perfected, I wanted to go ahead and share it, along with the changes I’ll make next time, because they still turned out quite yummy! In a large bowl, lightly beat eggs. Add parm, spices, chile, bacon bits, and cheese, and mix together well. *I kept the Parmesan cheese from the original recipe to act as a binder, since there are no breadcrumbs. I probably didn’t need this, though. When combined, separate mixture into eight equally sized portions. This time, I pressed the meat into a small rectangular pan, smoothing it until it was even and then used a knife to cut it into eight relatively equal pieces. A large ice cream scoop (one of the perfectly round ones) would be great for this, too. Again, be careful not to overwork the meat. 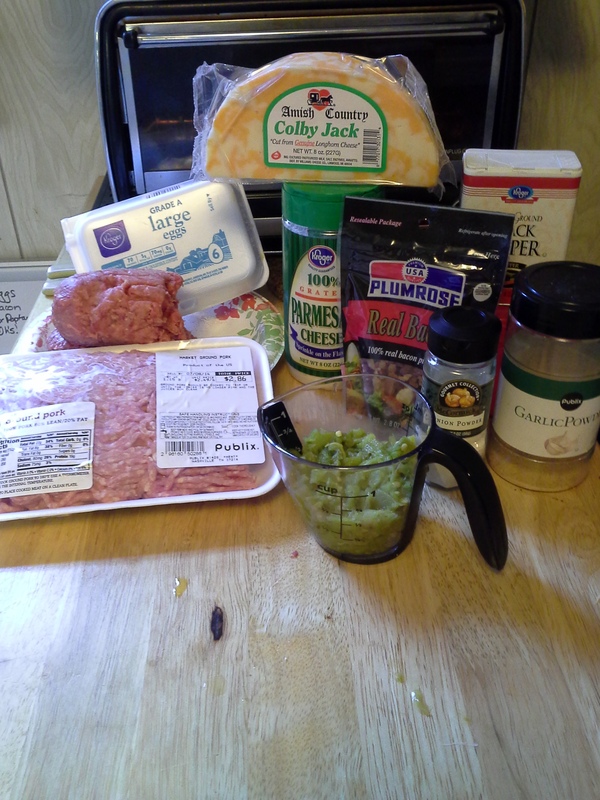 These will be LARGE meatballs. 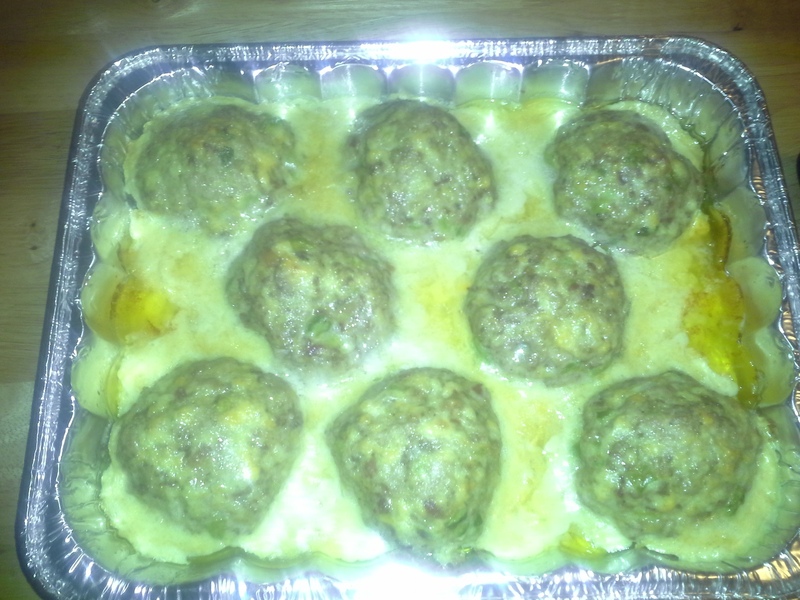 Place meatballs in pan as you finish forming them. It’s okay if they touch, they’ll shrink up some as they cook. Bake, uncovered, 40–50 minutes. There will be a lot of “juice” in the pan, so be very careful when removing it from the oven. (If you want, around the 25–30 minute mark, you can take it out and drain off some of the fat.) Unfortunately, a lot of the cheese cooked out, so the final product isn’t as cheesy as I’d hoped. Serve piping hot, topped with more cheese or salsa or cheese sauce or even between two lettuce leaves with tomato, onion, and pickle, if desired. For a meal later this week, I’m going to eat these smothered with queso with a side of Zucchini Chips. 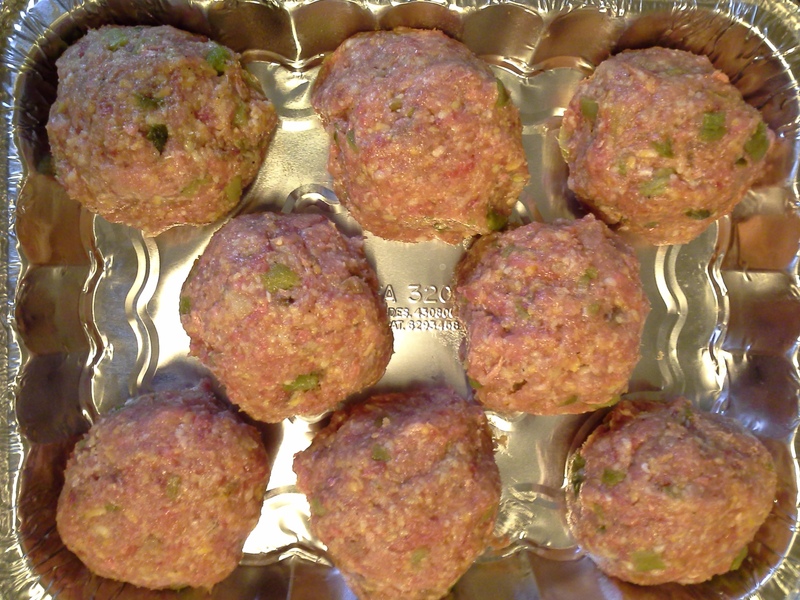 Instead of grating the cheese, I’ll cut it into half-ounce cubes and form the meatballs around them—that way, the exterior of the meatball will be somewhat cooked (crusty) before the cheese starts melting. I will also nuke the bacon bits to get them crisp before stirring them in with the rest of the ingredients—because they didn’t crisp up in the cooking process and give the bacon texture that I’d hoped for. I might also try these another time with a can of Rotel instead of just the plain green chile. Hi there. I wanted to tell you that I was excited to try some of your recipes. I do carb cycling, so not fully low carb, but 4 days a week I am and I’m always looking for new recipes. I checked out your twitter page and noticed that you are very close to home for me! I’m in Hermitage. I also work from home, so I can totally relate to what you are saying about eating out, or Panera 🙂 Anyways, just wanted to say hello and I’m excited to try some recipes of yours.